Giorgio Trettenero, Eduardo Grullón, Manuel A. Grullón, José Manuel López Valdés. Punta Cana, Dominican Republic.- The Latin American Federation of Banks (FELABAN) on Tues. paid tribute to banker Alejandro E. Grullón, for pioneering the national commercial bank, with the foundation 55 ago years of the Banco Popular Dominicano, and promoter of the country’s business development. On behalf of their father, Banco Popular and Grupo Popular president Manuel A. Grullón and AFP Popular president Eduardo Grullón received the recognition during the 52nd Annual FELABAN Assembly of the Latin American banking association. 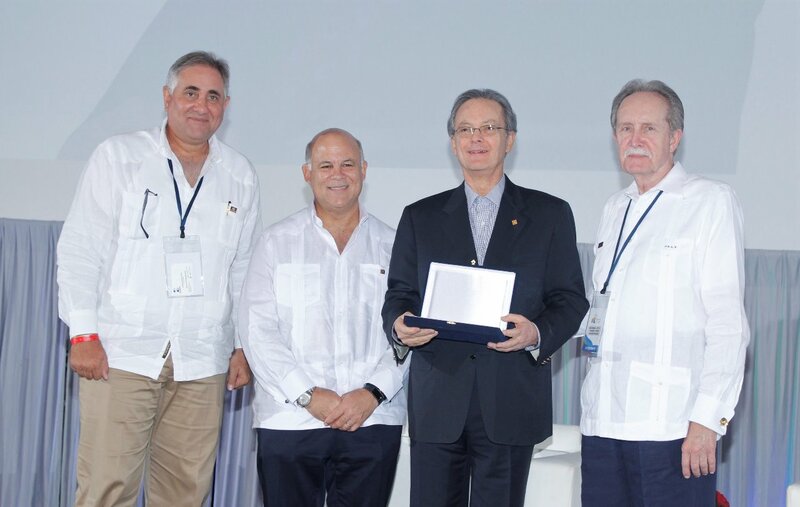 “For being the pioneer of private commercial banking in the country and for promoting with leadership, tenacity and spirit of service to society, the sustained development of the Dominican Republic’s financial and business sector,” says the silver plaque delivered by José Manuel López Valdés and Giorgio Trettenero, president and general secretary of Felaban, respectively.